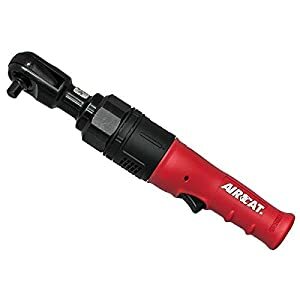 Best Air Ratchets Reviews: Only 5 Out of 184 for April 2019! Top Rated Air Ratchet: Good, Affordable, and Reliable! An air ratchet is similar to a hand-held ratchet, in that it performs the same operation but with the assistance of compressed air turning the ratchet shaft. Air ratchets are used where either a lot of opening and closing is required in a factory or garage setting, the other reason is for dealing with stubborn lugs that need extra torque to release them. In general, air ratchets are used for speed rather than torque, and as such is a hand-held tool that replaces the need for an impact wrench. There are many options to choose from when deciding to buy an air ratchet, and in many instances, it’s a matter of personal taste or siding with a brand name. Weight: how heavy is the hand-held unit? Torque: what is the maximum torque you can reach? Air Consumption: How much air does it need to provide the torque required for operation? I have prepared these three factors as the opening statement of my review, and these are really the most important factors to consider, apart from the price when choosing an air powered ratchet. So here it is, the Aircat 805-HT, a medium weight range, very high torque ratchet. This is actually a beast in a small package. Delivering a very high 130 ft-lbs., torque from such a small frame is truly amazing and places this small ratchet at the top of the power game. This beast is quiet, purging away at 84 dB, but delivering a powerful punch or raw energy at a reasonable price places this model at the top of my list or air ratchets to own. The AIRCAT 850-HT comes with a larger ratchet head design, so it eliminates the probability of “spreading” while it increases reliability. You can manage your torque through the variable speed trigger. My Take: One of the best and most powerful models to find in the price range it is in. Very sturdy and fast that comes with a good 2-year warranty. However, its weight can be an issue, but then you won’t get much torque without a solid body holding all that power inside. This is considered to be one of the best if not the best value for money air ratchets on the market today. Most reviews rave about the performance of this tool, so I decided to go out and buy one to see what all the fuss was about. To start off with is its price, reasonable, not cheap, but reasonable, and it is an Ingersoll-Rand brand, so that makes it something of importance. The next thing you get is the weight, under 3 lbs. Making it a lightweight tool that delivers a hefty punch of 55 ft-lbs., torque, which is usually enough power for these kinds of tools. The size compared to other tools is important, this is a slim, compact model, and is reliable with great support, after all its an Ingersoll-Rand. Take into account that this is really affordable for all budgets and that it delivers the necessary punch to handle most household needs, as well as mechanic requirements. It is a bit heavy on the air consumption side, but that’s due to design considerations when reducing the cost/effectivity engineering requirements. 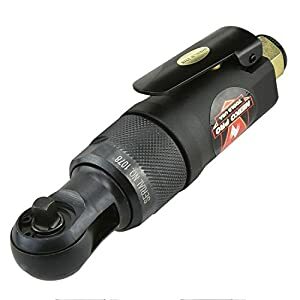 My take: This is an exceptional two figure priced air ratchet that is lightweight, powerful and delivering average noise outage at 94 dB makes this the best starter air ratchet around, as well as the best house and DIY ratchet out there. 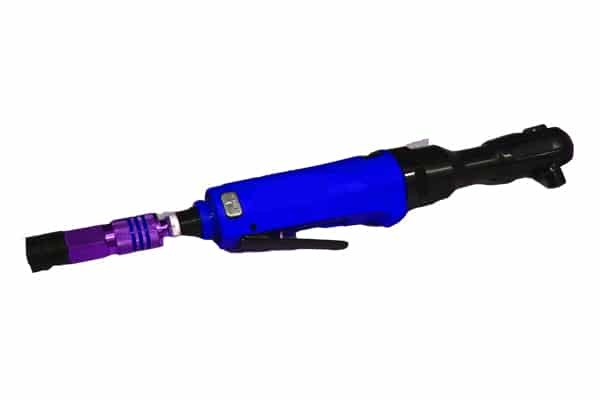 If you are looking for that ultra-compact, lightweight, and fast air ratchet, then this is the one you really want. It’s a great home use too, not suitable for heavy operations or a mechanics shop, but perfect for home and DIY usage. 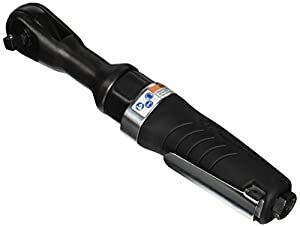 Its extreme light weight of only 1.4 lbs makes this an amazingly light tool to use, delivering a great 55 ft-lbs torque with minimal air consumption. This model is also super silent, delivering a low 84.4 dB level. My Take: This is a very small and compact model that provides excellent results every time you use it. If its small, light and useful you are looking for, then don’t go further than this review. This is the lightest, most powerful at its weight ratio and price tool to find on the market. This is a great backup tool when your big ratchet takes a vacation. This is also the best ratchet to use when dealing with the ¼” class and is really the best tool for small machine work. My take: Small, powerful and efficient. This is the baby boss of air ratchets. Its time to return to Ingersoll-Rand and their continuous efforts to bring excellent products to market. They did not fail with this beast. It’s a larger version than the 107G and packs a whopping 76 ft-lbs., torque with a 3.1 lb., body. Perhaps the only drawback is the price, you pay for the name as well as the quality. In this case, you are buying an air ratchet that is backed up by a commercial giant that can supply you with parts, accessories, and spares any time of day. My take: You get what you pay for, and in this case, you get a handful of power and reliability. This strong tool will deliver its 76 ft-lbs., torque at 220 RPM, which will cover every need, speed, power and speed and power…again. 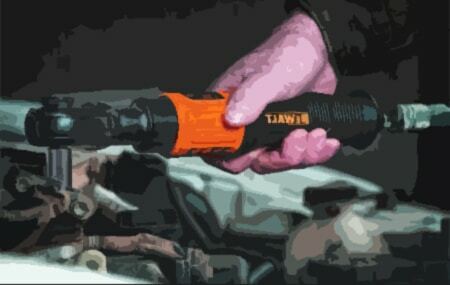 This is one of the best 3/8” air ratchets on the market, and perhaps the best for easy access engines. Its only drawback is its size and weight, where you need to work in confined places, this will not deliver as well as smaller and lighter models. If you are a first timer to the air ratchet market, then before buying an air ratchet you should consider the following questions. If you are an experienced professional user, then all I can do is give you an informed and hands-on experience together with public opinion review and hope that this helps you decide. Why do I need an air ratchet? Air ratchets basically perform the same duty as a hand-held ratchet with only one difference, they are powered by air, giving you that extra ease of use. 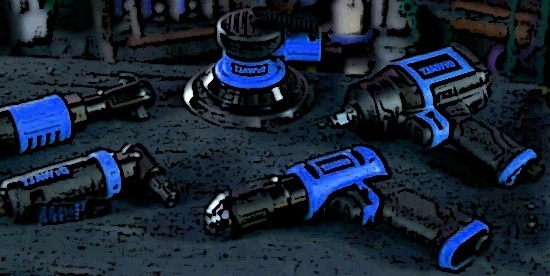 If you work with power tools and use them daily, you should add an air ratchet to your box of tricks. 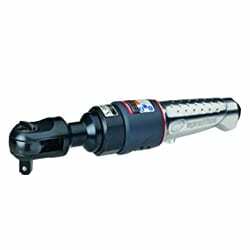 It will save you time and effort, just as an impact wrench saves you time and effort for those larger lugs. Are air ratchets used for heavy-duty tasks such handling lug nuts and suspension bolts? Good question (a pat on my back helps me through the day). The answer is yes and no since the larger lugs and bolts are usually dealt with the heavier air impact wrenches. However, when handling smaller jobs, or larger ones that are not stuck, a smaller air ratchet can do the trick. Remember, a stuck lug or bolt, due to corrosion requires much more torque to relieve it, if you work in a heavy duty environment, or handle old and rusting equipment, then an air ratchet is not the tool of choice. You hear this word frequently when visiting mechanics and tools hops. Torque is basically the amount of force you exert, and force can be exerted in a linear motion or a rotational motion. We are dealing with rotational motion since we are screwing and unscrewing lugs and bolts around a 360o axis. The force you apply is measured in both distances from the center of the axis and the force you apply. Force is measured in units of weight, such as lbs., or kgs. The distance is measured in imperial or metric. Size: Lugs and bolts come in many sizes. These sizes vary from 1/11” all the way up to 1”, anything above 1” is handled by an impact wrench and not an air ratchet. The rule of torque here is that the larger the diameter of the thread, the more torque you need to apply. So, a ¼” will need less torque than a ½” bolt. Grade: The grade refers to the material and thread used to manufacture the bolt. There are softer and harder materials, as well as thinner and wider threads. This means that the higher the grade, the “tighter a bolt may be closed, due to its higher tensile strength and finesses of the thread. Simplification: the higher the grade, the higher the torque required to open it. Thread: Bolts come with various thread dimensions. There are very fine ones and very coarse ones, the finer the thread, the higher the torque required to release it. Material: Bolts are most commonly made of carbon steel. However, you will find brass, bronze, and even aluminum bolts. The softer the material, the lower the torque required. Lubrication Over time, bolts and lugs tend to corrode, this is due to their exposure to the elements. Cars, boats and home appliances all get exposed at different levels to different environmental conditions. That is why it is best to use a penetrant before opening old bolts and lugs. For new appliances, or frequently replaced parts you might forgo this necessity. What is the most important factor for choosing the correct tool? There is really only one way to look at the answer, and that is to look at what you do and how frequently you do it. 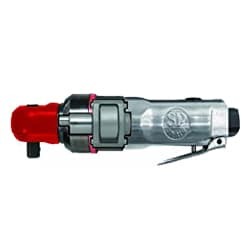 Home and Infrequent: If you just like to have power tools lying around and using them once a month, then you need to buy a basic model that provides you with low to medium torque. Home and Frequent: If you are an avid DIY freak or home fixer kind of person, then you will need a smaller yet sturdy air ratchet that is light and can deliver medium torque. Professional: If you work in a machine/car/marine environment then you need a fast, powerful and very light air ratchet. Anything else will just make your life harder. Apart from power and speed, what else should I consider? Warranty: Power tools are used and abused. They receive a lot of wear and tear, and the more frequently you use one, the more likely you will need to replace parts. This is why you must get a minimum 1-year warranty. You must also look for a tool that has good reviews, meets your requirements and is easy to repair. Air compressor source is another issue to consider. If you are buying a pneumatic tool, you need an air compressor to supply the power. Choosing the best air compression using is a science all unto itself, and I will not go into that issue here. Let’s just conclude that you need a reliable source of compressed air. Drive head: The other factor to include in your decision-making process is the anvil size, do you want a low duty head, which is usually ¼”, or a medium duty size which is ½.” Depending on the most common sizes you will handle is the factor that decides what size and type of ratchet you will need to buy.